If you enjoy playing card games but tend to shy away from those that require you to learn all manner of different playing strategies, such are required on games such as Blackjack and Video Poker, then perhaps it is time you played at a Playtech software powered casino. By doing so you are going to come across games such as their range of arcade games, which offer a completely different playing style, but many of which are based around card games. 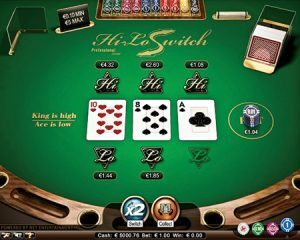 One Playtech designed arcade game that you may enjoy playing is their Genies Hi Lo game, on which you are faced with nothing more demanding than selecting if the next card dealt out will be higher or lower than the previous one. The stake levels you can play that arcade game for are low, but they are adjustable and as such you can play for a range of different stake options in the currency you have set your casino account at. You will then be faced with guessing whether the next card is high than the card displayed on the screen or lower, depending on the value of the card displayed the odds for both of those possible outcomes will vary. By making a correct decision you will then be given the option of collecting your winnings or continuing the guess higher or lower. On the left have side of the game screen is the win ladder and in total you can try and correctly predict whether each new card dealt out will be higher or lower than the previous one a total of eleven times if you do decide, but you can collect at any stage of the game. Whilst there is no skill involved in playing this game other than knowing the value of each card and the chances of the next one being higher or lower it is a fun game to play, and as you can collect at any time there is no requirement to have to make a certain number of correct decisions before you can collect any winnings you have achieved. Another major attraction of playing any of the range of Playtech designed arcade styled games such as the Genies Hi Lo game, is that most casinos that have them available give away bonuses and promotional offers that can be used on those games as well as the casino games. If this game does appeal to you then you will also be able to test it out for free at any casino that does have it on offer, so you can try it out at no risk before playing it for real money, so do consider doing so and see how you get on playing it!